Ask fellow campers about "Gooseberry Falls State Park" and nearby attractions. 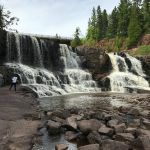 Gooseberry Falls State Park is a great place to visit and stay. This was our 3rd trip to the campground. The sites are large with lots of tree coverage. The bathrooms are clean for state park bathrooms, but could use some updating. We never had any issues with cell coverage on T-Mobile. Gooseberry offers lots of trails and beautiful views. With that being said there are not any parks or play structures for the kids. We camped at Gooseberry Falls State Park in a Tent. Most tent sites have a wood chip pad. Something to note is there is no longer first come first serve sites, you may now reserve any site in advance, so book early if you plan to go on a weekend. Go down the trails from the campground to see Lake Superior. Most people just view the fall, there are minimal crowds and views are breathtaking. I occupied a campsite with no hookups which was fine with me. The site was large enough for my Class B Camper Van with plenty of privacy. I was parked very close to the comfort station which is an updated building constructed by a CCC crew in the 1930s. There was plenty of hot water and the facility was very clean. This park has beautiful views of Lake Superior and the lovely Gooseberry Falls. There are many miles of trails, both paved and primitive. I fortunately did not encounter any problems with mosquitoes or ticks, although I hear they can be pretty bad at other times of the year. I am already planning a return trip to this beautiful state park. We camped at Gooseberry Falls State Park in a Motorhome. Close to shopping and restaurants in Two Harbors. This is One of several state parks along the North Shore of Lake Superior. Non-electric campground. Lots of space between sites with plenty of trees, very secluded. Roads are narrow with some tight turns, but we had no problems with our 34' trailer. Not many sites to handle big trailers. Showers were clean, but water was too hot for my liking, only one temperature, and you have to keep pushing the button to get water. Lots of nice hiking and biking trails right from the campground. 1/2 mile walk to the falls from the campground. Kids enjoyed climbing on the rocks and waterfalls. Mosquitos were not too bad, but the flies were terrible. Our site was 2- tiered. The camper was about 3 feet higher than the picnic table and fire ring. Steep hill connected the two levels. We camped at Gooseberry Falls State Park in a Travel Trailer. In Silver Bay check out Palisade Head. We stopped Jimmy's pizza for some pretty good pizza. Nice walking trails and campsites, great views of Lake Superior. 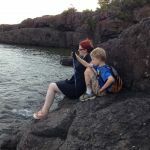 We camped at Gooseberry Falls State Park in a Travel Trailer. While this campground has beautiful modern bathrooms, our shower experience ruined our opinion of the overall facility. The showers have no temperature control (ice cold water was only available). To take a shower you must continually push the single control button. The sites are wooded and nicely separated. 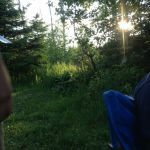 However, the large number of mosquitoes prevented us from enjoying our campfire. We camped at Gooseberry Falls State Park in a Motorhome. Great state park campground. Sites nearly secluded from each other, neat old CCC buildings (which have been updated with modern restrooms & showers), new visitor center, friendly staff, great hiking & bike trails to the shore, falls, and deep woods. Roads and pads are gravel, a bit tight with trees in spots. Some sites may fit a large unit. We had no problem with 30' 5th wheel. Close to town of Two Harbors. Would have gotten top rating if sites had views of water and electric available. We camped at Gooseberry Falls State Park in a Fifth Wheel. Be aware that in addition to your camping fee, you have to pay a vehicle fee for the park. Sites are heavily wooded, and some aren't suitable for big coaches because of trees and backing conditions. We camped there in a 35 ft motorcoach with two slides. We stayed in spot #1 and got into the spot with only the littlest bit of difficulty. But some spots were clearly not meant for big coaches. The spots have a secluded feel - a very private feeling. No hookups at all - but this wasn't a problem. We didn't even run our generator. I planned my meals to cook outside and we stayed outside until dark and then went to bed. Cell phone coverage was spotty. We camped at Gooseberry Falls State Park in a Motorhome. About midway between Two Harbors and Silver Bay on 61. Abundant shade in campsites. Only reason I don't rate this park higher is no electricity. You gotta boondock here. As with all Minn. St. Parks permits are obligatory if you are spending three nights or more or anticipate visiting other parks on the north shore buy the annual sticker at $25. Minnesota uses a rolling year so chances are sticker will still be good next season. Sanitary building is spotless. Gooseberry has excellent facilities with large visitor center/gift shop, miles of trails (some ADA and paved), and Lake Superior location (good for boatwatchers). As with any park on the north shore reservations are a MUST during peak season. Best for tents, pop-ups, and smaller trailers. We camped at Gooseberry Falls State Park in a Tent. 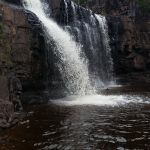 Are you affiliated with Gooseberry Falls State Park ?